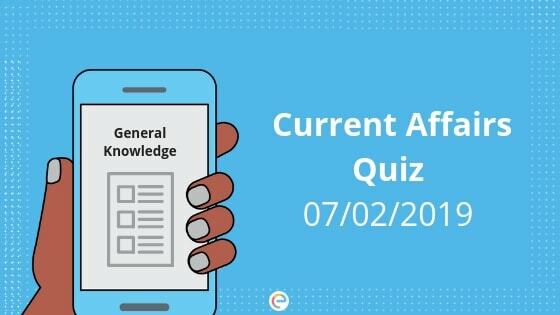 Current Affairs Quiz for February 7, 2019: This section covers the GK and Current Affairs quiz with daily MCQs on National Affairs, International Affairs, Economy, Banking Affairs, Polity, Geography, Environment, Sports etc. for competitive examinations viz. UPSC, SSC, Bank PO, Bank Clerk, IBPS, Railways, Government Jobs, UPPSC, MPSC, and other state exams. This current affairs quiz will help you in the General Awareness section conducted in various Banking, SSC, Insurance, Railways, and other govt job entrance exams. Current affairs quiz will also help you outshine in the crowd with all the information you gain from this article. So, follow our Current affairs quiz daily to crack any kind of competitive exams you come across in India. Wait no more and let’s take today’s Current affairs quiz. 1. Which city hosted an international symposium on creativity and Freedom? At a time when the digital sphere has pervaded almost all spheres of life, and when nearly everything creative has been commodified, a symposium on “Creativity and Freedom” took place in New Delhi. The discussion was on subjects of freedom for artists to the significance of museums, the role of archaeology in the modern world etc. 2. What is India’s rank in the index of online companies doing business abroad? Explanation: India is Ranked 11th when it comes to online companies doing business abroad but it is still ahead of the UK and US. Singapore and Hong Kong are the number one countries in the index. 3. Former Cricketer Brendon McCullum has announced his retirement from Australia’s domestic Twenty20 tournament – Big Bash League. He belongs to which country? Explanation: Former New Zealand cricketer Brendon McCullum has announced his retirement from Australia’s domestic Twenty20 tournament – Big Bash League. However, McCullum will continue playing in other T20 leagues before beginning his career as a coach. 4. What was the theme of this year’s World Cancer Day? Explanation: World Cancer Day is an international day, which is marked on 4th February to increase awareness of cancer, and to encourage its prevention, early detection, and treatment. The theme is “I am and I will”. Explanation: 30th Road Safety Week 2019 is celebrated in India between 4th Feb to 10th Feb. There have been various awareness campaigns and events which are being conducted across the country in all the states. The theme is “Sadak Suraksha Jeevan Raksha”. The aim of this activity is to make people more aware of the traffic rules and to persuade them to follow rules while on road; Road Safety Week is observed annually. 6. Recently, Prince Albert II arrived in India. He is the state head of which country? Explanation: The head of state of Monaco, Prince Albert II arrived in New Delhi on a week-long visit to India. He attended the India Monaco Business Forum followed by a round-table on energy and climate. 7. In which city was 20th Bharat Rang Mahotsav inaugurated? Explanation: The Minister of State for Culture Dr Mahesh Sharma, inaugurated the 21-day-long nationwide theatre spectacle Bharat Rang Mahotsav at Kamani Auditorium in New Delhi. Bharat Rang Mahotsav was established two decades ago by the National School of Drama to stimulate the growth and development of theatre across the country. 8. Which city hosted the 6th Meeting of the Mission Steering Group of National Health Mission? Explanation: The National Health Mission was launched by the government of India in 2013 subsuming the National Rural Health Mission and National Urban Health Mission. The government said that 8000 Health and wealth Centres have become operational in 35 states and Union Territories. Minister of State for Health and Family Welfare Ashwini Kumar Choubey, said this while chairing the 6th Meeting of the Mission Steering Group of National Health Mission in New Delhi. 9. The National Board of Wildlife recently accorded wildlife clearance for which train project in India? Explanation: The National Board of Wildlife, led by Union Environment Minister Harsh Vardhan, in January 2019 accorded wildlife clearance to the Mumbai-Ahmedabad High-Speed Rail Project (MAHSR) that passes through the Thane Creek Flamingo Sanctuary and the Sanjay Gandhi National Park in Mumbai. 10. Under Andhra Pradesh’s vote-on-account budget for 2019-20, how much amount is allocated under the Market Intervention Fund for farmers? Explanation: In an election eve vote-on-account budget for 2019-20, the Chandrababu Naidu government in Andhra Pradesh on February 5, 2019, announced an economic support scheme for farmers and doubled the unemployment pension to Rs 2,000. The state government also doubled the allocation to Rs 1000 crore under the Market Intervention Fund for farmers. 11. Which leader has proposed a new missile treaty with the potential to include India? Explanation: US President Donald Trump has proposed a new nuclear missiles treaty that could possibly include India as he delivered the State of the Union address to a joint session of Congress. Some of India’s Prithvi and Agni class missiles could fall under the ambit of such a treaty. 12. Which is the first state to set up a Price Monitoring and Research Unit to track the violation of prices of medical devices and essential drugs? Explanation: Kerala became the first state to set up a Price Monitoring and Research Unit to track the violation of prices of medical devices and essential drugs. The move came more than 5 years after NPPA proposed such a system for the states and UTs. 13. Which country will construct The ‘Church of Saint Francis’ and the ‘Mosque of Grand Imam Ahmad Al Tayeb’? Explanation: UAE leaders announced the construction of the “Church of Saint Francis” and ‘Mosque of Grand Imam Ahmad Al-Tayyeb’ in Abu Dhabi in honor of the two religious leaders. They will serve as beacons to uphold the values of tolerance, moral integrity and human fraternity in the UAE. 14. Which city has the new Campus of the National Museum Institute? Explanation: The new Campus of the National Museum Institute was inaugurated by Union HRD Minister Prakash Javadekar in New Delhi. Four new courses that are Archaeology; Palaeography, Epigraphy, and Numismatics; Structural Conservation and Cultural and Heritage Management, are expected to be commenced. 15. Which social messaging app started the “StartUp India Grand Challenge”.? Explanation: In an effort to encourage entrepreneurs and small businesses in India, Facebook-owned messaging app Whatsapp announced the “StartUp India Whatsapp Grand Challenge”.The challenge will give away a total of $250,000 (Rs 1.8 crore) to the top 5 winners.WhatsApp has listed healthcare, rural economy, financial and digital inclusion, education and citizen safety as the themes for the startup challenge. To provide you with the satisfaction of overall coverage on current affairs, our GK team at Embibe are crafting these most important questions and answers daily based on the events around the world. This current affairs quiz will ensure that you have not left any important questions behind for the day. The explanation provided in the Current affairs quiz for each question will help you memorize the answer even better, preparing you for the time in need. Irrespective of the exam, this Current affairs quiz will help you jog your memory any time, any place. The main purpose of this Current affairs quiz is to help you reach your goal and we do hope we are being successful in doing that. Do not forget to check our daily Current affairs Quiz on Embibe for more important questions with answers.